So, FI and I were talking about this last night. He's getting all the men in the wedding party -- his three GM, my father, my brother (who's an usher and playing the processional song) -- growlers from a local brewery with locally brewed beer. (I think, but I'm not totally sure, that he's doing different beers for different people, based on their beer preferences). He's also having the growlers etched with their names. I am already giving my BMs jewelry to wear in the wedding -- which obviously doesn't count as a gift to them, since I'm providing it to them to wear in the wedding -- but in light of that, I kind of don't want to give them MORE jewelry as a real gift. Does that make sense? I'm also thinking that, since they're all so different, I want to get them each something individualized and personal, rather than a lump "BM gift." I'd love to hear what you all have done or will do or have had done for you. I'm getting each girl a GC to their favorite local mani/pedi place and plan on pairing it with something geared to them as an individual--which has been hard for some reason. I only have FSIL solo gift so far which was a cute tea & saucer kit that had a cute owl design on them (she studies owls and loves tea). I'm hoping to get other idea's when I see them all this weekend at my bachelorette party! For my three best friends, In addition to the bridesmaids gifts (they are like my MOHs-- I did not give them a title since I could not pic between the 3 of them, but they are hosting my bachelorette party and having been amazing with anything wedding) I made them a nice picture frame with a picture of the four of us at each others weddings (with a blank space to add a picture from my wedding). I like the analogy of shopping for them like it's their birthday. I'm going to take that and run with it. And probably gift them their gifts BEFORE the rehearsal dinner, because there will be too many inside jokes associated with the gifts. Shop like it's Christmas or their birthday. I would avoid getting them more jewelry. Gift cards are always safe and appreciated. I've bought my BMs Kate Spade Saturday makeup bags and I'm treating them like Birch Boxes, but without the sample sizes. Nail polish, lipstick and lipgloss, champagne gummy bears, wine juiceboxes, sparkly hair pins from ban.do, face masks, etc.. No two bags will be the same - I'll be customizing them to fit each of the girls' taste in products. I also like the wallet with a giftcard or two idea. I got each of my BMs earrings for the wedding (obviously not the gift) and will get them necklaces that are specifically to their taste. I'm also thinking that I'll make up a little basket with their favorite beverage or food (tea, wine, chocolate, coffee, etc). My group doesn't do gifts either - we do time together for birthdays as we are all so busy and it can be hard for us all to get together. My girls are getting jewelry, hand decorated glasses for their beverage of choice (a set, not just one), a framed photo of us (all photo nuts and have them in our offices and homes), a nice hand written letter, and one of those wooden hangers with their names. Because I got that before I started lurking on The Knot. 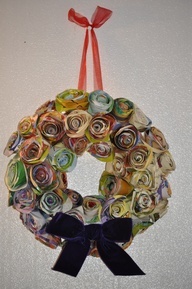 I have been making wreaths for mine out of book pages and sheet music. They look beautiful. Whichever ones I make that don't go to my friends are Christmas gifts for people or will go to my craft fair. I have trouble putting them on my etsy store because I dont know how to ship them. Muppet, that is so cool. I would LOVE one of those as a gift. Muppet, those are seriously amazing! 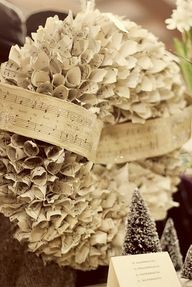 I have a book from Anthropologie that details how to make all sorts of beautiful decor from old book pages - for some reason I'm kind of squeamish about tearing old books apart, but I love the idea of using sheet music, too! That first wreath is just incredible. These aren't the ones I made, but I can take some photos of them. I have one that looks exactly like the first tone. I learned how to do it from Pinterest. I put little pearls in mine. I'm SOOOO proud of myself. FI was impressed too. He doesn't normally have much interest in my crafts. That one takes a really long time to make. I'm starting another one like that tomorrow that is bigger, you need like 150 roses of different sizes! The best part is that I found a source for old books for 25 cents a piece. For the sheet music, I bought some on ebay first, and then I found a box at a barn sale of just tons of it for $10. For the ribbon, I used some fabric that I had already, and for the base, I used a 40% off coupon at Michael's. So they aren't expensive to make....just takes a lot of time. One of my BMs is a HUGE reader, so if I were AT ALL crafty, @MuppetFan, I'd totally try that. But I know myself well enough to know the limitations on my skill set. It's made harder by the fact that two of the girls and I don't do Christmas or birthdays, per se; we usually treat each other to dinners. The third BM is my SIL, and she always asks for DVDs for Christmas, which I always get her, but which isn't really what I'm thinking of for a BM gift. You all gave me really good ideas, though, and I think I know what I'm going to do. Thanks, ladies!! They do sell them on Etsy. Not sure what you want to spend, but they sell on Etsy.